This entry was posted in Pre release. Bookmark the permalink. Blame my ocd but the preview window is not the same sized (width) as the channel listing and goes into the epg section a little bit (maybe 2cm). Other then that layout size, works well. Thanks for the addition. Great job. Any plans on adding picture in picture so that if back on android home screen, preview could work when on android home screen? By the way, this is only in details view. The other views the preview is positioned correctly. Could you, please, send a screenshot of the issue? Seems fine. This offset on the right is due to the vertical scroll bar in the channels list. Just go to a channels group with only couple of channels (without scroll bar) and preview should look symmetrically centered. I understand. Thanks for taking the time to explain to me. Keep up the good work. Awesome job Nikman! That was my only complaint about PP was the lack of preview and program info in the epg. Cheers! GREAT feature – “preview” very good upgrade. It would be nice if would update the channels in the preview PIP window as you move up or down in the guide. I really like this new feature with the addition of the description is a plus. Wonderful work – hats off to Nikman. Has there been any issues with the EPG disappearing after while. Sometimes the EPG guide stops showing info. Do you have any suggestions to correct this? Do you mean not showing additional EPG info near the preview for some channels after a while? Have you noticed this issue? You can’t sideload APK upon the version installed from Amazon appstore. You should uninstall previous version before. However, you will lost “Full version” option if one. The stuff is a turn off I set all my channels decoders correctly and when ever there is a change on the backend with my provider all my decoders are messed up again. Auto does not work! You should take that up with your provider or look for a better one. So y lo ur saying you dont have decoder issues? Hey Nikman, can we please get an option to set decoder settings by group? I got a two providers that don’t like the same decoders unfortunately. So, I have to manually set decoder channel by channel. Hello, could you guys incorporate chromecast functionality directly to the perfect player app without using third party apps? However, you could try “Perfect Cast IPTV” app to stream channels from smartphone to Cromecast device. Do you think in future we can record a tv program directly in internal storage or in USB key with a box android ? Feature is possible, but not on recent plans. I am getting looping on channels with 148b3. I went back to 1473 and hardware decoder works without looping. I have tried other decoders in 148b3 and now native seems to work for the most part but obviously custom buffer is not used then. I am unable to check the “Preview” box. Is there something I am missing here? You must have “Full version” for this option to be available. Thanks for your reply. what would be good is to be able to adjust the disappearance of the TV banner bottom more quickly because I think it takes too much time to bend down. On new version 1.4.8b3, nothing happens when I click “Unlock Full Version”. This is on Amazon Fire Stick. I would love to see the new preview feature in action. “Preview” option should also be available on Fire TV devices. It is there but not clickable. Then I try to unlock the full version but when I click “unlock full version” in the settings, nothing happens. It just stays on the same screen like nothing has happened. Could you try to exit the app (doube “Back” key press) and then restart it again (no need to remove it from taskbar, etc.)? Will the option be available? Thanks! I mean, “Preview” option should be available on “Amazon” devices. Yes it’s working perfectly now with this new version. Thank you so much. When viewing the EPG Timeline, what keys to use to move forward or backward in the timeline. Is there a key or options be switch to last channel watched. 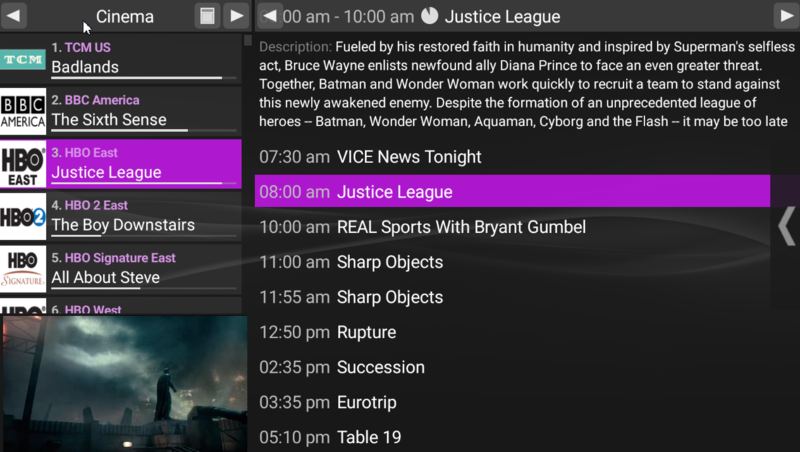 Long “Left”/”Right” key press – scroll through the EPG. “Left” key press during playback – switch to the previously played channel.